experience on the right device at the right time." The troubled Windows 8 chapter of the Microsoft story is about to come to an end. 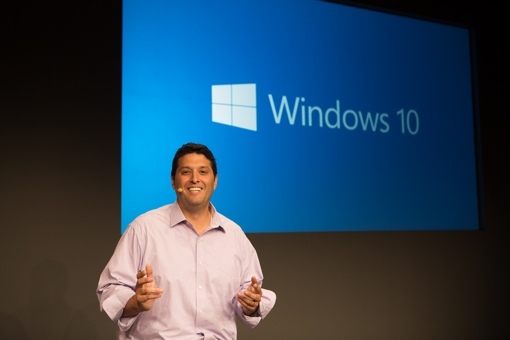 Today, at a media event in San Francisco, the software giant officially unveiled Windows 10. You read that right: Microsoft has skipped Windows 9 entirely and is moving straight to Windows 10, as if to highlight just how different the new OS is its from the cumbersome-to-use, poorly received Windows 8. Much of Windows 10 seems designed for a Windows 7 computer user in mind. The clunky metro default has been swapped out in favor of a more familiar desktop look, complete with a Start button. You’ll see Live tiles in the Start menu, but they they’re a lot less intrusive while seeming a lot more relevant. Windows 10 seems to have improved on the search experience, with a universal search tool (web and local) in the Start menu. A new Task View makes it easy to see the contents of the apps you currently have open much like Mission Control in Apple’s OS X. Microsoft has even made some upgrades to the old school command prompt, another nod to those who gave up on the OS after Windows 7. The new Microsoft Windows 10 operating system is due sometime in mid-2015. It will be a free upgrade for existing Windows 8 owners. Upgrade pricing for Windows 7 owners has yet to be announced. You can learn more about Windows 10 on the official Windows blog and in the short video below.